Discussion in 'iPhone and iPad Games' started by PROAPK, May 12, 2016. Dicemancer: Let's Lock 'n Roll! Best. Dice. Ever. A clever combination of tactics and luck! Dicemancer is a game for turn-based RPG gamers and casual puzzle gamers alike! Play now for FREE! 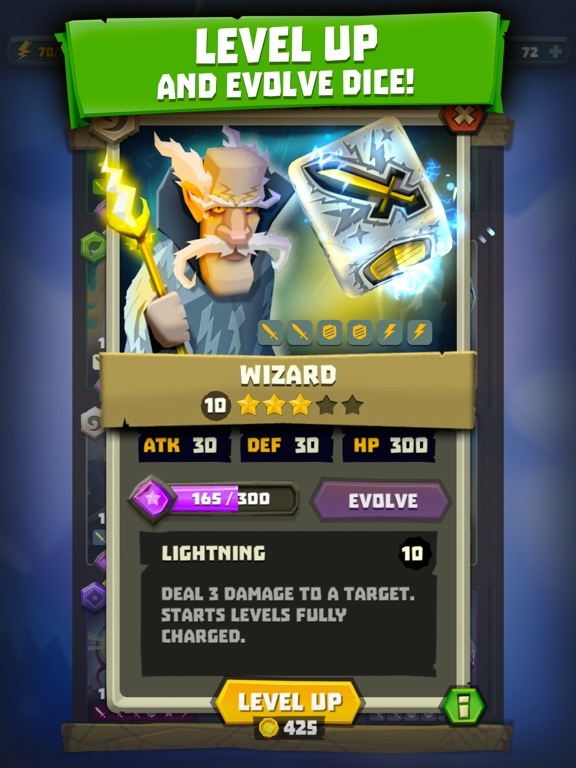 Become the Dicemancer and assume the incredible ability to turn creatures into dice. Wield your dice to save the Land of Chance from the marauding minions and evil allies of the wicked Snake Eyes. And maybe, just maybe, you can save your brothers in the end. Play with the BEST DIGITAL DICE in the world! 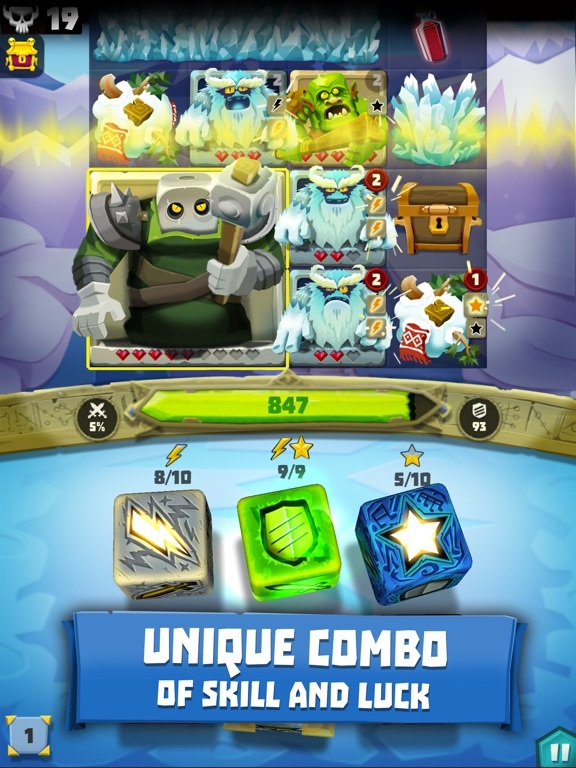 Battle different CASCADING MONSTERS in puzzle-like levels! 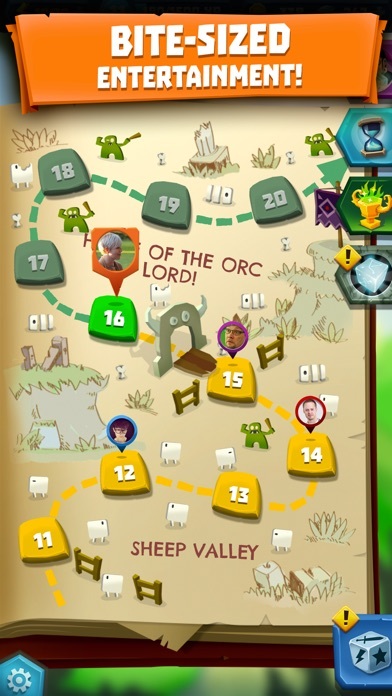 COLLECT new dice by winning BOSS FIGHTS in every episode! 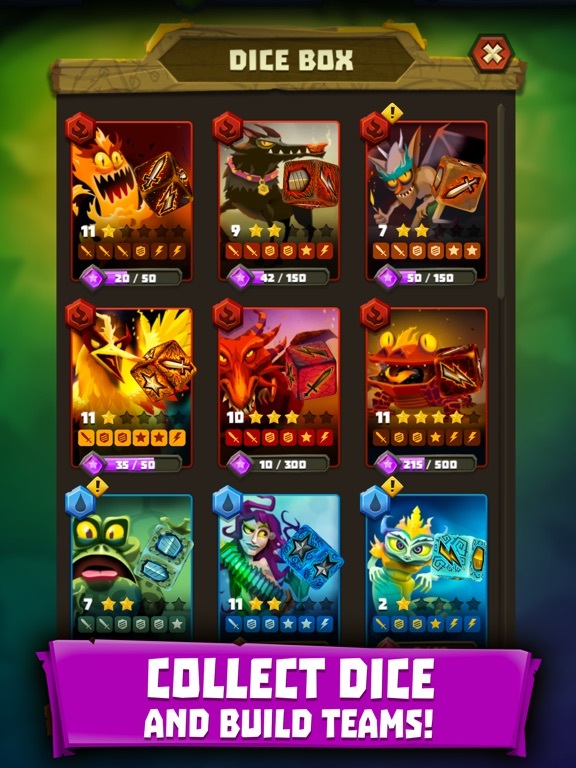 EVOLVE your dice and use their SPECIAL POWERS to continue the adventure! Travel in the Land of Chance and discover NEW AREAS AND ADVENTURES! Collect TREASURE from each level! 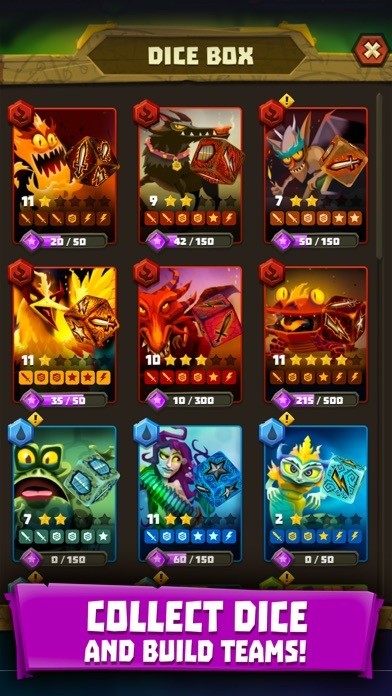 It's very freemium (with stamina, other timers, multiple currencies, a lot of ads, etc. ), but the core gameplay is kinda fun. I was ready to write this off after the first few too easy levels, but it is starting to get some complexity as I go along. Interesting game but the tutorial is broken. It has you select a new dice to add to your current set of dice but you can't click on the dice. And since it's a forced tutorial you can't do anything else. Hopefully the devs get this game fixed because it looks interesting. Looks like fun from the video. Seems interesting enough. The first ten stages are obviously intended to be a "tutorial" of sorts, because once you get past them the XP-per-level increases and you get the option to opt-in for notifications, etc. 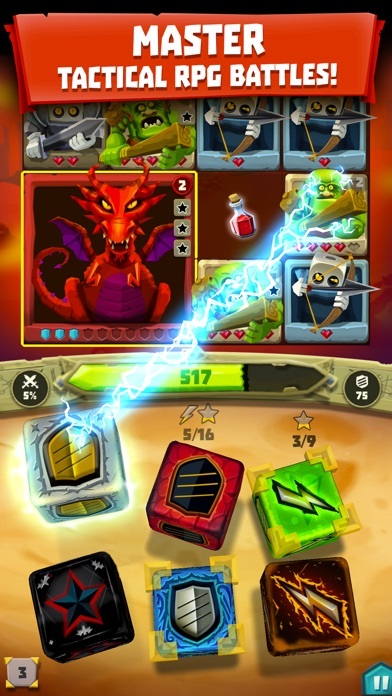 When it's all said and done, it seems to just be a game around rolling six dice, each with four different symbols (Sword, Shield, Star and Lightning). 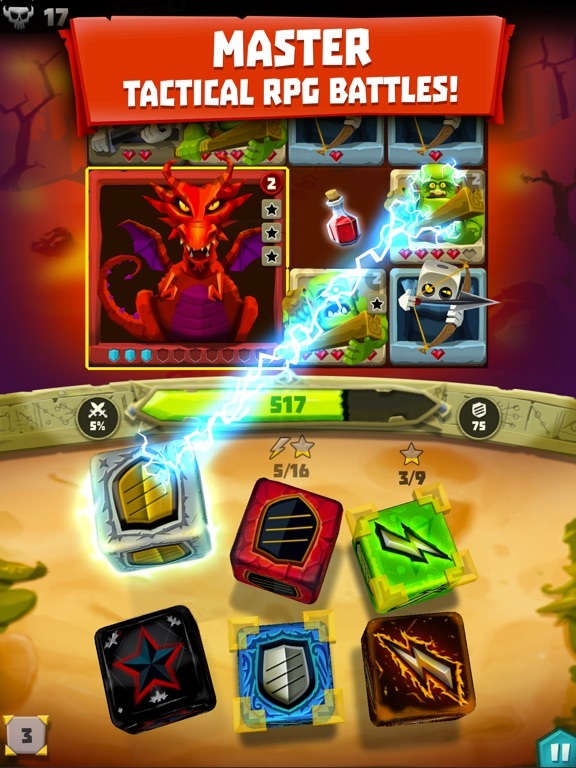 The dice have different distributions for the symbols, each non-generic die has a special power (which requires rolling a certain number of Star/Lightning symbols to power), and your dice "XP levels" determine your overall health and chance for an Attack symbol to double-hit. You can "lock" up to five of the six dice from your previous roll - and the longer you go without locking, the more you can lock at once. Which adds some strategy; you have a Gate that you need to destroy with a ton of Archers behind it. Do you 'lock' Stars to guarantee you can shatter the gate next turn? Or do you try to roll them normally and save those locks for a later boss fight? 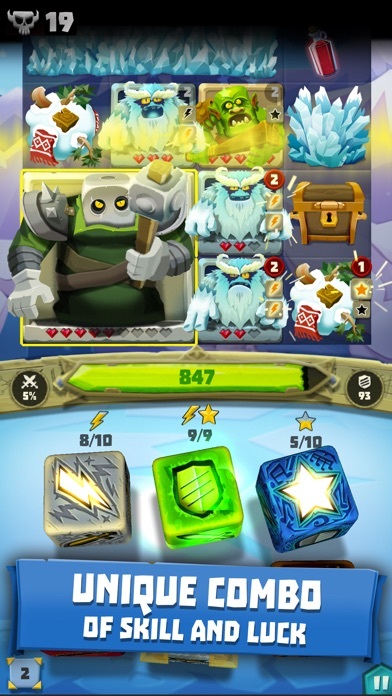 It looks like "Daily Tournaments" unlock at Level 12, which could have potential. The overall fundamentals and 'rules' of the game seem simple and straightforward, I just need to find a 'hook' to entice me to keep playing. I just love it when people are awful at a game and blame the game for it. This is quite fun. It actually qualifies as unique, IMO. I think if this were a premium game and could be played in landscape, I'd probably play the crud out of it. Fantastic game. 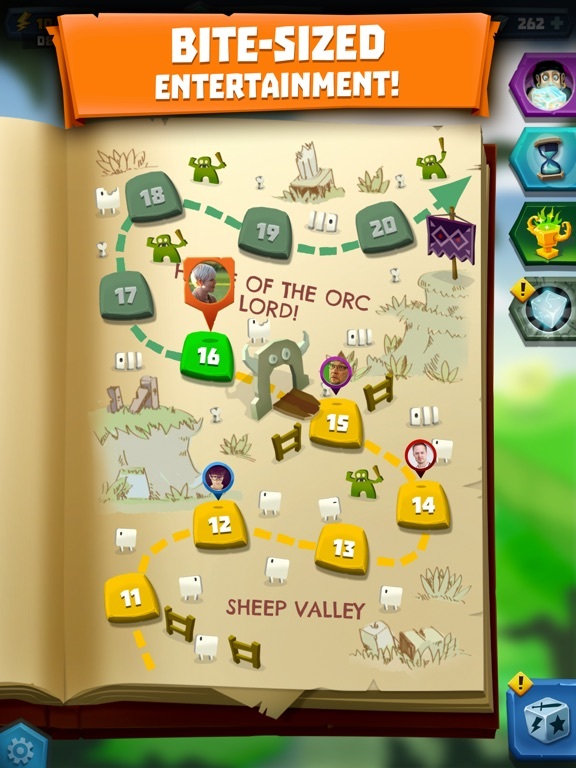 The small details in strategy really start to shine as the levels progress. Focusing on holding dice and which dice to use balances the randomness of the dice roll. I'd encourage people to play a few levels and start to learn the game before discarding it. Wish it didn't have an energy system, but otherwise I'm really enjoying it. Yeah. I mean, you can get screwed by the dice, but there is some strategy in deciding what die rolls to hold and when. I'm a little bit confused about its name though; is it called "Dice Hunter" in some countries and "Dicemancer: Let's Lock 'n Roll!" in some others? Also it seemed to be announced last year but we started talking about it like right now 2017. I haven't played along for days, only about 30 minutes into it, so far I found it quite interesting and requires strategical thinking to win (I also lost the first stage trying to see if it's purely luck-based so I'd be able to swipe it through). For people who are afraid of purely random or totally rigged gameplay: it is certainly not. The idea of dice locking and target selection/prioritizing is not uncommon in board games at all. The initial tutorials are certainly boring but they always are. The dice collection + slot composition + level progression part seems quite deep to me; I only hope it's not too $-based (since from its polished 3D looks, it feels like an expensive game to develop). I'm keeping it on my phone so we'll see. 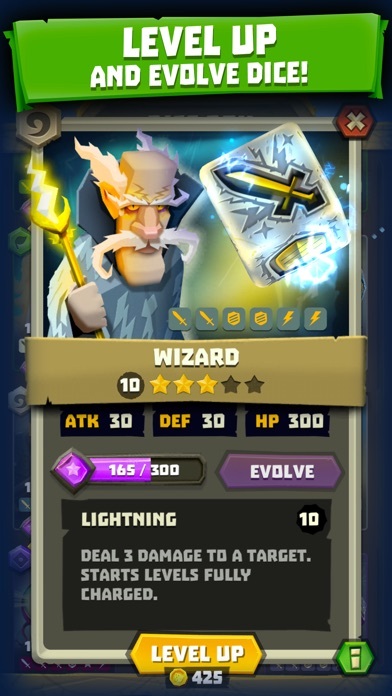 [Edit] Some more time thrown into the game, and I started to see the energy issue people were talking about. I thought the energy bar can be refilled by watching video ads but it doesn't work that way. As a result, while the gameplay was still quite enjoyable, I had to stop and think about payment. The game isn't a pay-once premium game either which is a pity. I also really wish there's a better deal with the energy system. I already paid 7 dollars for beginner package, and at stage 60 but the energy bar fills up way too painstakingly slow. I am not going to pay more until this issue gets resolved.